While uber-geeks like me might play around with (open source) KeePass secure databases, the wise user keeps things simpler and standardises on a commercial solution from day one. 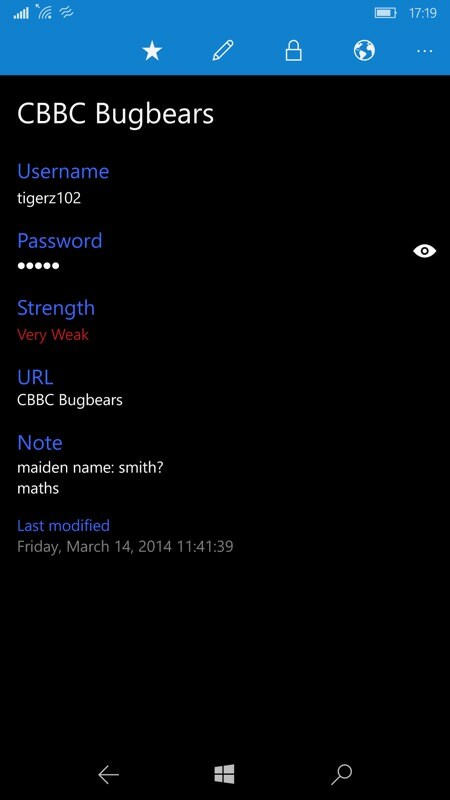 Enpass is one of the newer breed of properly supported secure stores - there are extensions on the desktop for password injection, but here I'm looking at Enpass on Windows 10 Mobile, the synced and backed up place for all your secret stuff. And apart from some 'fit and finish' and the usual import issues, it works pretty well. 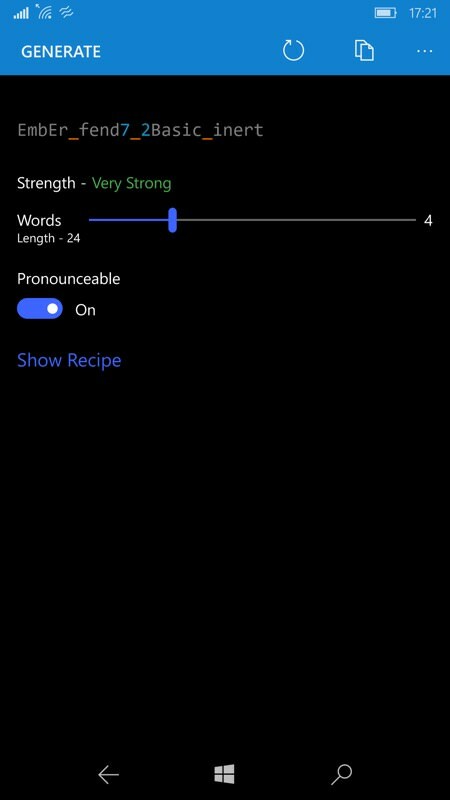 One note before I start - although not shown below in the review, Enpass is also available for Windows Phone 8.1 in the Store. 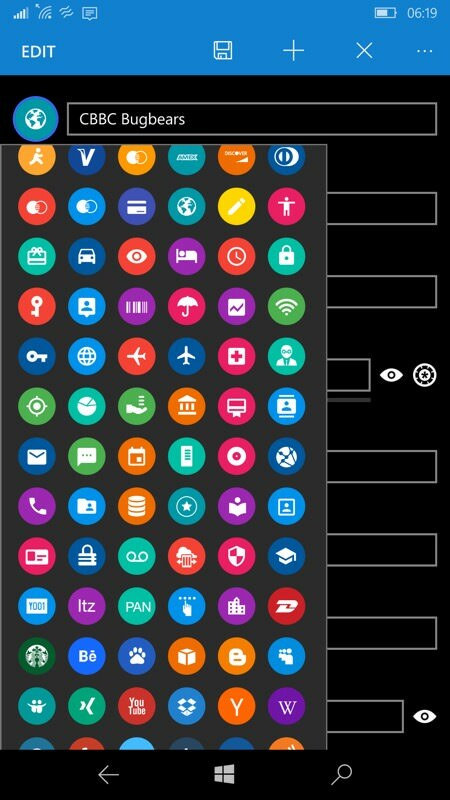 Just look on your old Lumia and you'll find it. And it all syncs in the same way, don't worry! Enpass, it seems, has done just about everything right. Cross platform? Check. Cloud-synced? Check. Import facilities from just about every other secure system in the world? Check*. Make the desktop clients free? Check. Sell the mobile clients as one-off purchases rather than a silly subscription system? Check. The * in the last paragraph is because, by its very nature, there's no way to seamlessly import data from another system. That is itself encrypted and Enpass can't know exactly how, so even with the password it's necessary to do a manual export of data (e.g. into XML or CSV text files) and then import these intermediate files into the Enpass desktop clients, and thence to the Cloud. Which worked OK for me, though all group and category information was lost in the transfer. 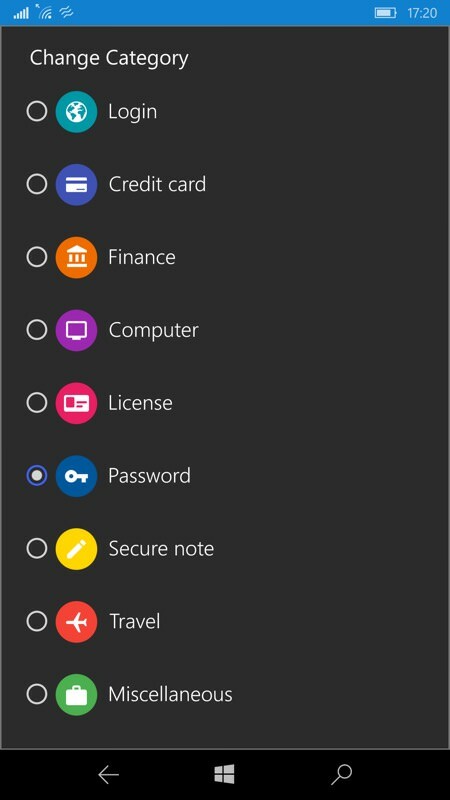 And, somewhat unfortunately, there's no way that I can see to assign or rebuild these groups/categories in Enpass on either desktop or on the phone. Therefore, I'd recommend, not for the first time, that you only attempt to get going with Enpass (or any other secure database system) if you have less than, say, 40 secret items already, i.e. few enough that some massaging, copying and pasting, or even retyping wouldn't be the end of the world. Me, I have over 2000 items in my KeePass 2 secure database (which dates back a decade and which lives mirrored in Google Drive and OneDrive, plus on all computing devices I own by extension) and any importing would have to be utterly seamless. 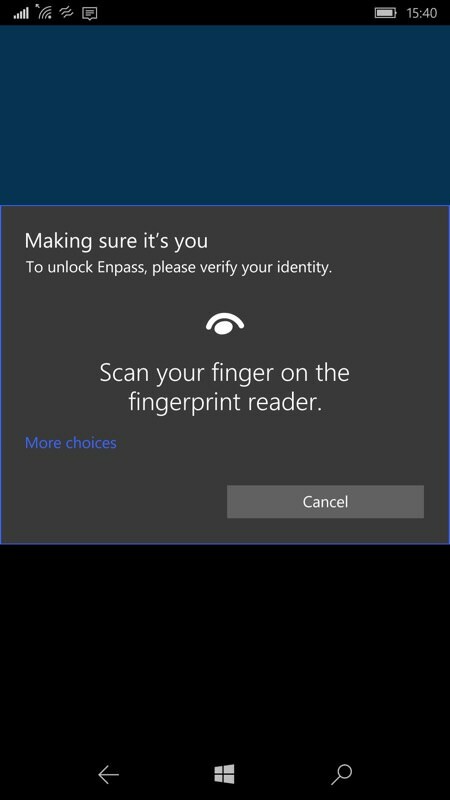 Enpass is updated every now and then and certainly not abandoned, hence full support for Windows Hello, either via iris recognition or (on the IDOL 4 Pro) fingerprint recognition; (right) a typical view of secured entries in my Enpass database. 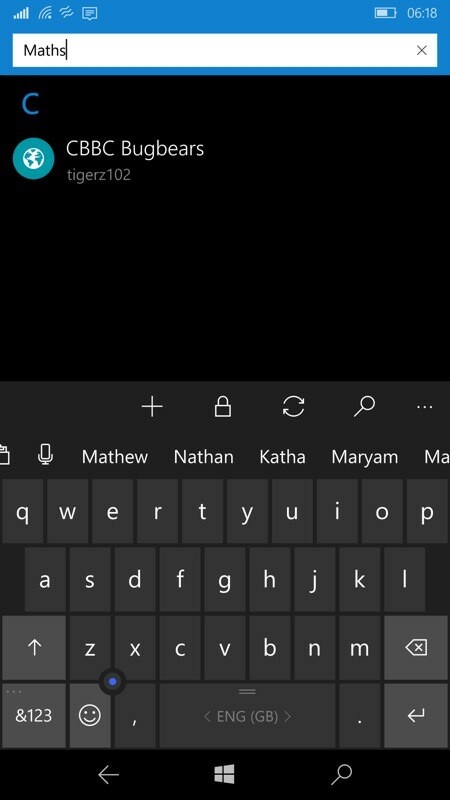 Icons are chosen manually (see below) and you get main title and username here but (thankfully) not passwords, for privacy reasons. 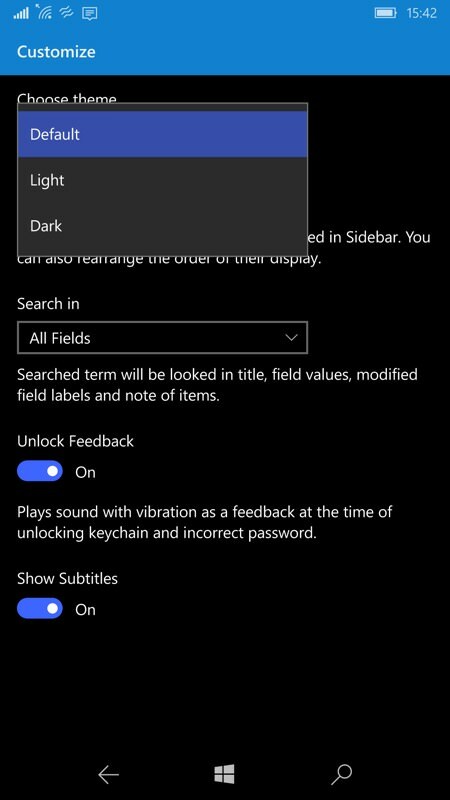 Searching is quick and matches all fields, as here, with individual entries shown in full with secret password fields hidden by default - tap the eye control to reveal, again for privacy reasons. Categories are potentially very useful at grouping similar types of entry, as listed here. And - interestingly - you can change the category of an entry in this mobile client, helpful when assigning one from scratch, while I couldn't find a way of doing anything with categories in the desktop client. Unfortunately, you can't (again, unless I'm missing something in the UI) add your own categories, though with 'Folders' (especially), 'Favourites', and 'Miscellaneous' on offer there's a good chance that you can still keep things pretty organised, however quirky your life; (right) you can also change the displayed icon for each entry, overriding the default icon for the relevant category - there are several hundred to browse through, though again no way to create or pick your own from scratch. 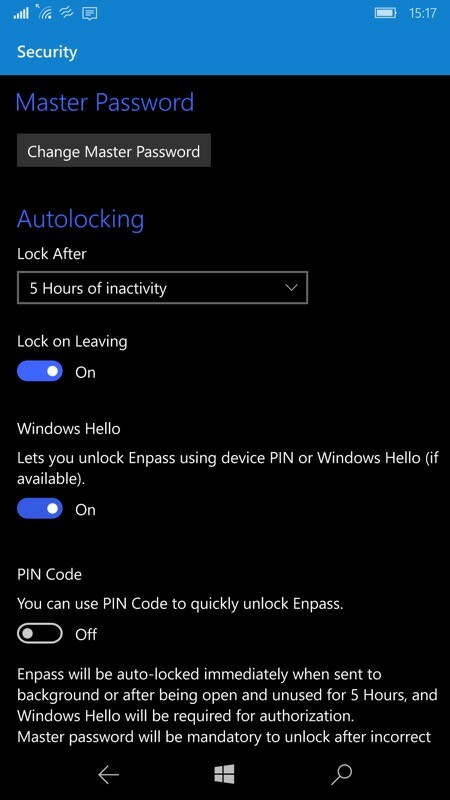 The key feature for me, as with simpler UWP systems, is that you don't need to worry about Enpass auto-locking in the background (as it should, for security reasons), since Windows Hello is fully supported. 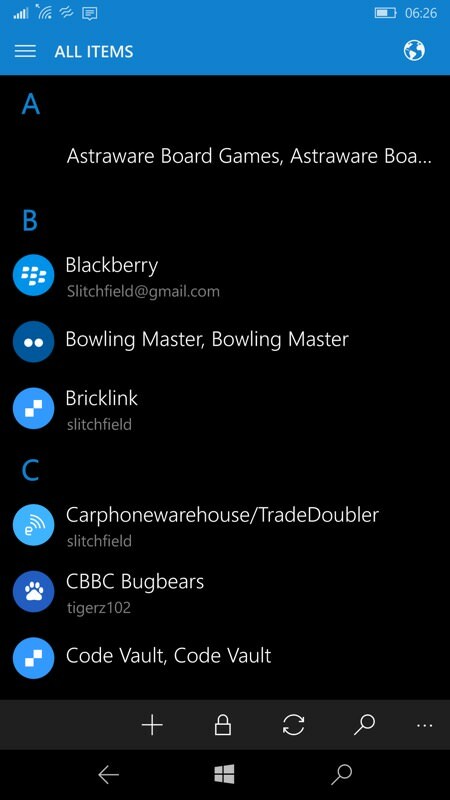 One fingertap here on the sensor and Enpass is opened and the data store decrypted. 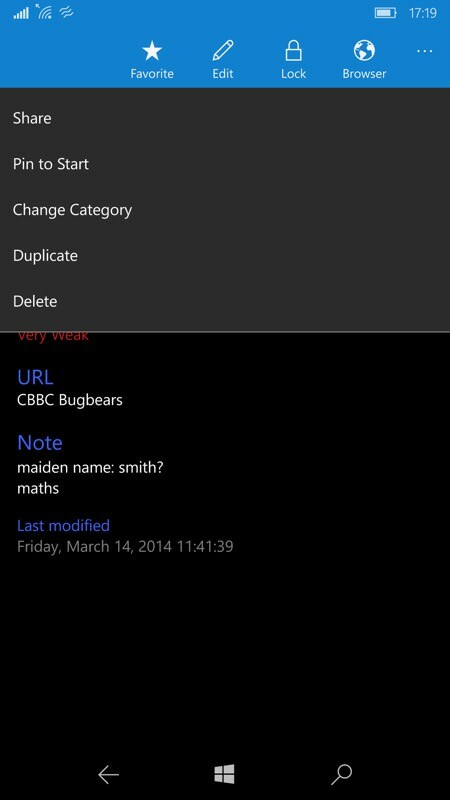 It also auto-syncs to the Cloud when re-launched, to make sure that all the entries are bang up to date. 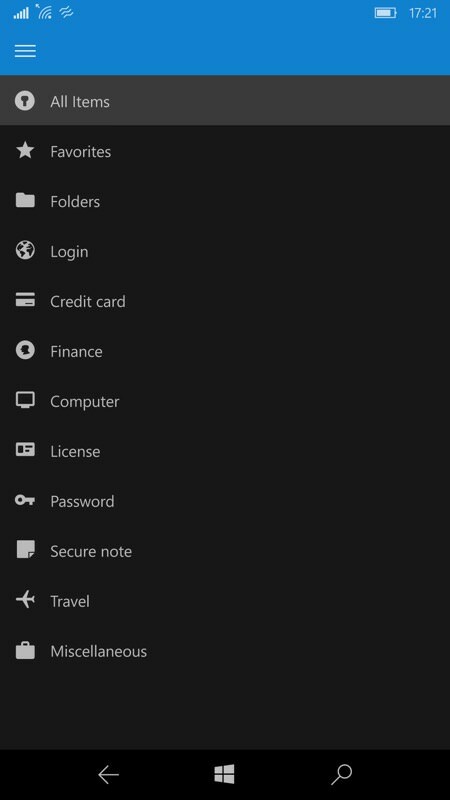 The default theme follows Windows 10 Mobile itself, though you can override this to Light or Dark if needed; (right) Here I'm syncing with my Enpass store in OneDrive, though you can just as easily sign into Google Drive, Dropbox, or half a dozen others. It really is up to you, and very flexible. As with all good password/security systems, there's a built in password generator, with a copy function to paste the result anywhere it's needed. Handy if you're terrible about thinking up new passwords that have enough entropy. 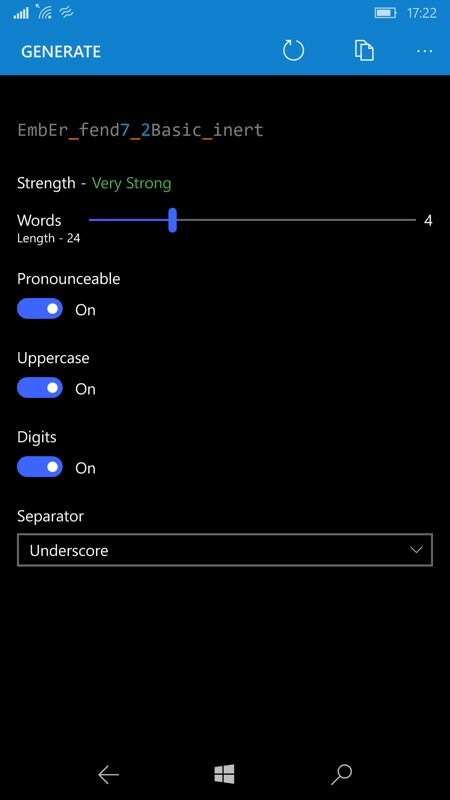 The generator here is particularly nice as you can go into great detail on length and characters allowed, complete with a unique 'Pronounceable' toggle, in theory helping you both type and remember the result. A very impressive bit of coding here. 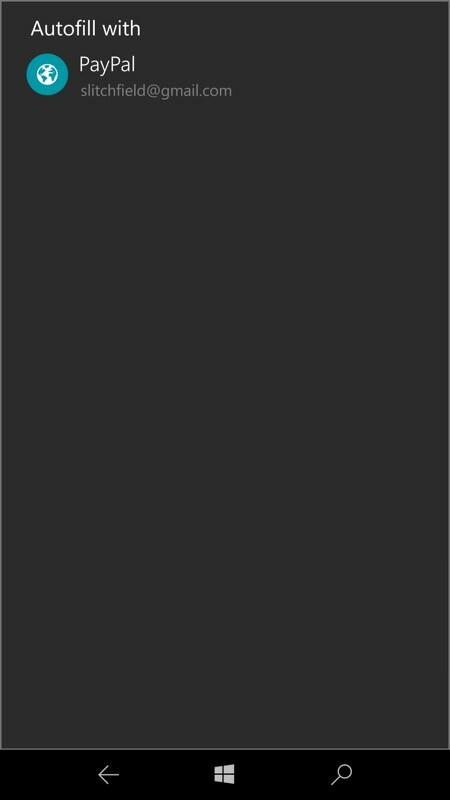 Although Enpass can't leap into action in Edge because of browser restrictions in Windows 10 Mobile (you don't get extensions! ), there's an internal browser based on the Edge engine. 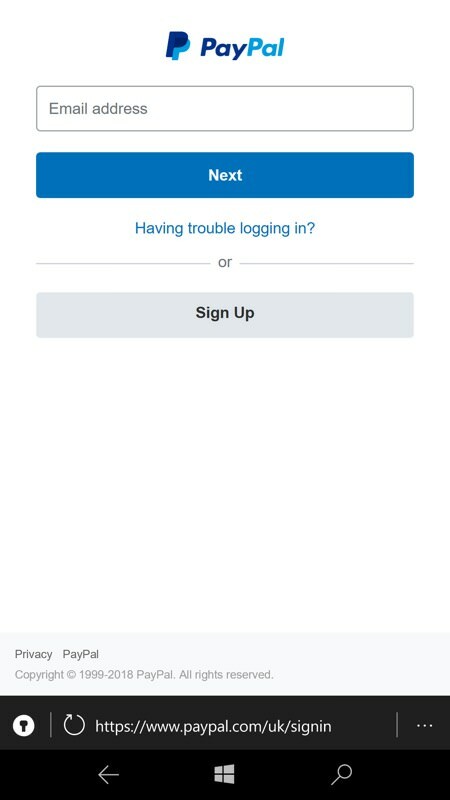 If you can train yourself to access web sites this way then you can use the handy padlock control to auto-fill usernames and passwords with a single tap. The system works well but, as I say, you have to be within Enpass all the time, so it won't suit everyone! The star feature, over and above the Windows Hello support, is probably the synchronisation system, which works at the entry/record level. 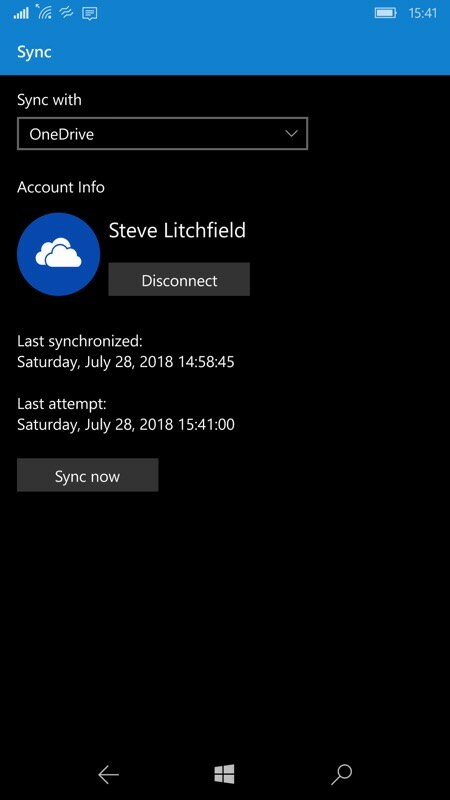 Meaning that even if you add something to your desktop Enpass client and also (say) change something on the phone, at the next sync both alterations will be seamlessly merged. I tested this and it works brilliantly. 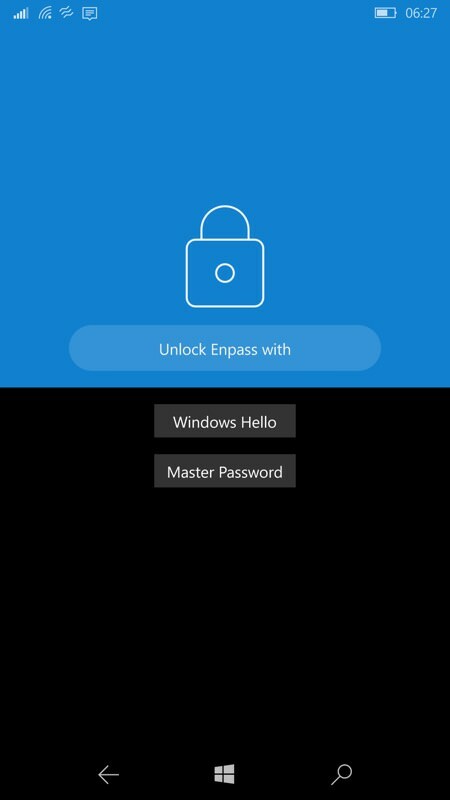 I came away impressed by Enpass as a whole but somewhat underwhelmed by its stability under Windows 10 Mobile. From small cosmetic glitches to crashes back to the Start screen when logging in, it does seem as though it was left 99.9% complete and that an extra bug fix stability update is needed. In fairness, this could also be down to Windows 10 Mobile itself, which hasn't exactly had a lot of TLC from Microsoft in the last year, other than essential security updates. Comments welcome - I know Enpass has been mentioned a number of times in the past here on AAWP, so real world data points would be handy. Has it saved the day for you - or let you down at all? In the meantime, Enpass is here in the Store. And also on every other computing platform known to man. Which is cool.